I’m all for finding the inner artist in everyone, and have long been an advocate for bringing arts education to the under-served, disenfranchised, and the non-artist. We all, potentially, have an artistic voice in there, somewhere- it just may need some nurturing. I admit, I’ve sometimes found the financial and political machinations of the art market hard to fathom, but the word “criminal” hadn’t come to mind until last week when I read that George Zimmerman’s painting, his very first, had fetched a whopping $100,099.99 at auction. Albeit it was Ebay, not Sotheby’s, but still. The sale opened at a starting price of 99 cents. At least George was optimistic. 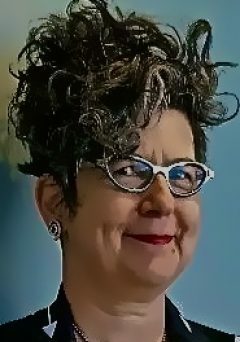 So who are these ninety-six bidders- Patrons of the Arts? Collectors of Americana? I can’t imagine what possessed them. How did they even know of the painting’s existence? 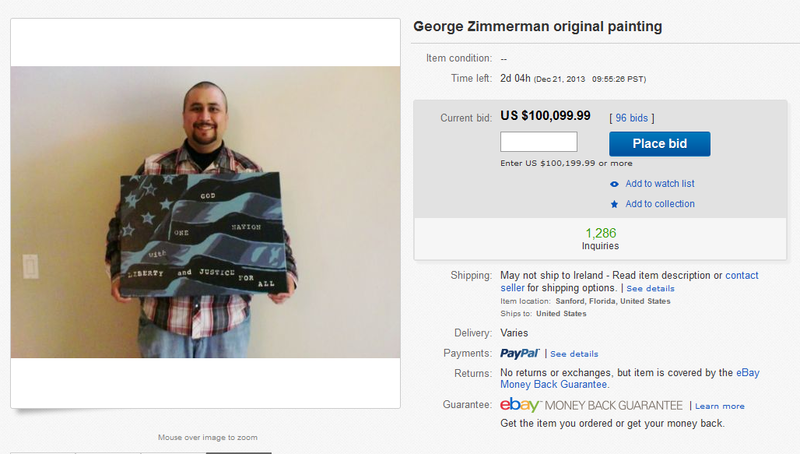 Is there a ‘saved search’ category for “acquitted killer novice painter’s first effort?” In a not too surprising twist, Ebay removed an anti-Zimmerman painting by artist Michael D’Antuono the same day as George’s painting sold. Fifty percent of the proceeds from D’Antuono’s auction were to have gone to the Trayvon Martin Foundation. I wonder if doing that one painting helped George with his pain as much as watching the Ebay bidding soar from 99 cents to $100,099.99. I wonder what kind of paintings Trayvon Martin’s parents could ever paint to begin to fathom the loss of their son. Or maybe they are doing something else to heal. ← Don’t Open Wide: What’s a Hungry Gal to Do?